On Monday 25th March, it was Year 3 and Year 4's turn to represent Prince Rock in the Manadon Cluster Football League. The children showed fantastic teamwork and they really enjoyed themselves at this event. They lost their first two games but they won their last game 5-1 to finish strong! On Monday 4th February, seven Year 5 children took part in the newly formed Manadon Football Cluster league organised by PAFC. The children really enjoyed the event and they competed against other Plymouth primary schools. Unfortunately, the children did not progress to the next round as they came 3rd in their group but they all said they enjoyed the event and left with smiles on their faces! Next term, it will be the turn of Year 3 and 4 to compete in the cluster league! We are extremely proud of the children that attended the reason tournament at Goals. They worked well together as a team and showed good sportsmanship. "Wednesday 16th January 2019 – What a great start to the new year! 10 teams from schools in the PSSP came along to Goals today for our termly Primary and Special Schools Football. Teams from The Cathedral School, Prince Rock, Oreston, Eggbuckland, Leigham, Marine Academy Primary, St. Peters CofE, Dunstone and Old Priory all came along to take part in our friendly, fully inclusive, round-robin event. This is a competition with a bit of a difference… although schools do compete for points, the emphasis is mainly on promoting excellent qualities such as Respect, Team Work and Determination. Every one who takes part in our event receives a certificate but the staff from each of the schools get to select just one of their children to receive a special medal for displays of outstanding sportsmanship. There was some fantastic Football on display today and some brilliant team work. It was certainly no easy task for the teachers to select their medal winner today. At the end of the event, the scores were added up and the winners announced… Congratulations to Oreston Primary who were our overall winners and to Eggbuckland Vale who were a very close second. Well done to all of the teams that played today – I hope that you all enjoyed the event as much as I did?! I would like to say a huge thank you to the young leaders from DHSG who braved the weather with us to referee our games – you did a fantastic job! Thank you to Ms Ricks as well for organising such high quality leaders for us. Well done to everyone ho took part today – I am looking forward to seeing you all at our next event on Wednesday 06th March 2019." On Monday 26th November 2018, eight boys from Year 5 and Year 6 represented the school in the first round of the Bettinson Cup. 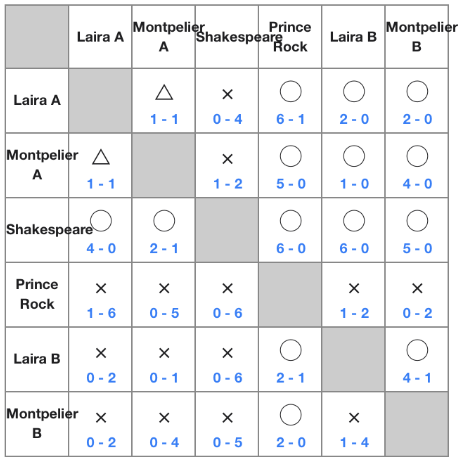 During the event, the boys played three games in total. 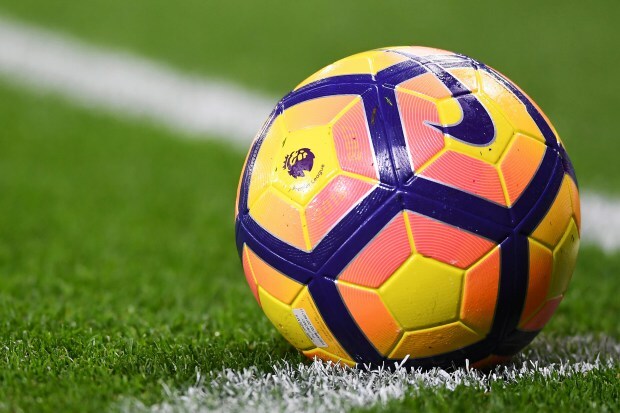 The first game saw the children draw 0-0 draw with Oreston Primary, the second game was a 0-0 draw with Montpelier and the third game ended in a 2-0 defeat against Widey Court. Unfortunately, as a result, we have not progressed to the next round but the boys were a credit to the school and they enjoyed themselves on this event. On Friday 16th November 2018, eight Year 6 boys represented the school in the PSFA Football Knockout Cup. The boys all worked together well as a team and it was an extremely entertaining game. At half time, the score was 0-0 which was a fair reflection of how even the game was in the first half. Just after half time, Prince Rock went 1-0 up through an excellent solo goal from Archie. The boys were thrilled and continued to work hard to create more chances. Unfortunately, the boys couldn't hold their lead and Oreston came back to win the game 2-1. All eight boys were a credit to the school and they persevered and worked hard until the final whistle. We wish Oreston good luck in the next round! Well done to our Year 4, 5 & 6 children who represented the school at the Goals Football Tournament on Wednesday 19th September 2018. The children all had an amazing time at the event and showed the competition's values of respect, determination and teamwork. We were extremely proud of all their efforts! "A blustery day today for our first PSSP Primary & Special Schools Football event for this school year. A great turn out with 9 teams taking part in our fully inclusive event. Teams from Montpelier, Plympton St. Maurice, Leigham, Pomphlett, Oreston, Prince Rock, Marine Academy Primary, Woodford and Cann Bridge all came along to take part. This event is not only an opportunity to represent their schools and compete but we also use it as an opportunity to celebrate some outstanding sportsmanship values such as Respect, Determination and Team Work. 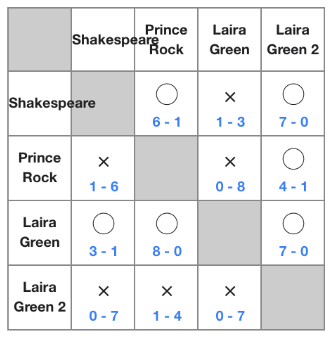 This is a round-robin competition with 5 points allocated for a win, 3 points for a draw and 1 point for a loss. Everyone who takes part receives a certificate but we also award a very special medal to an individual on every team; this unenviable task of selecting just one player falls to the teachers from each school – they are looking for some outstanding displays of sportsmanship, respect or team work. Well done if you were the lucky recipient today – you must have done something to really impress your teacher! It could not have been closer today for the top spot – we had two teams finish on the same points so in order to calculate the final result, we looked back over the total number of goals scored by each team…incredibly, both teams had scored exactly the same amount of goals! 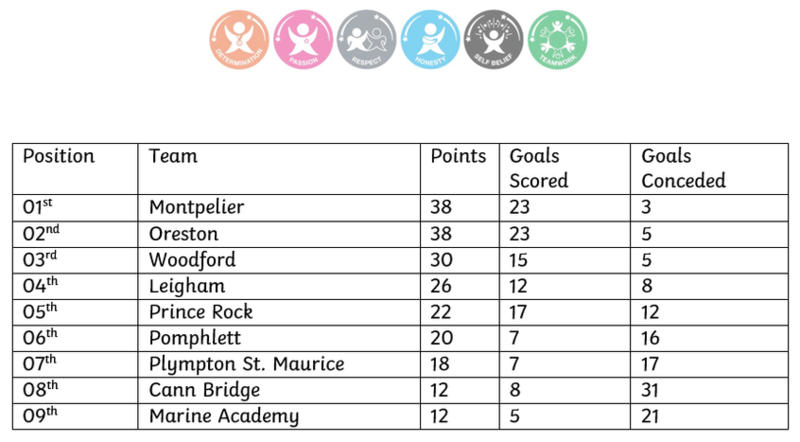 It now came down to the number of goals conceded throughout the tournament… Huge congratulations to Montpelier who were the overall winners today and also to Oreston who were in second place by the narrowest of margins – 2 goals difference! Well done to everyone who took part today – you all played incredibly well and I really hope that you enjoyed playing. I would like to thank the fantastic Young Leaders from Devonport High School for Girls who came along to referee and score our games for us today – it is really thanks to their hard work that this event ran as smoothly as it did, so thank you all. I am already looking forward to our next event – Wednesday 07th November – hope to see you all there."